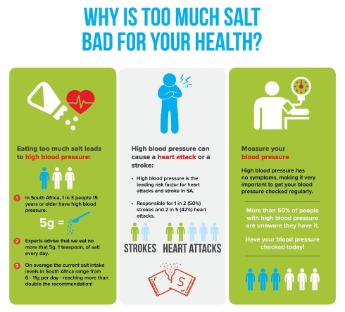 This year for World Salt Awareness Week, WASH focussed on the forgotten dangers of salt in our food, and encouraged everyone to eat less than 5g of salt per day (WHO recommendation). All WASH members were invited to support the week, and call for more action from the food industry, government, catering sectors, health professionals and general public. WASH disseminated a poster via the WASH website, as well as via WASH members and social media. Below is a brief account of some of the activities that took place around the world. 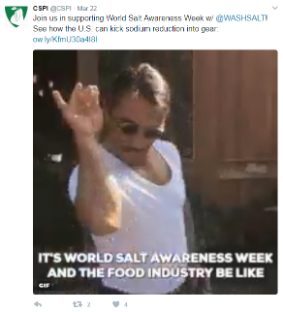 They promoted this via their twitter page with a GIPHY celebrating World Salt Awareness Week, in partnership with WASH. This tweet (below) had 42.4K impressions. They also participated in the American Heart Association’s Salt Chat on Twitter. The Public Authority for Food and Nutrition produced 10,000 copies of flyers in both Arabic and English to distribute in Trolly, a widespread convenience store in gas stations in Kuwait, as well as in Caribou Coffee busiest outlets and Kuwait Flour Mills bakeries. They also produced a hanging banner which was displayed at the largest mall in Kuwait/The Middle East (The Avenues). Furthermore, the Authority designed a short (1:28 min) awareness video, which was broadcast on Kuwait TV twice during interviews with dietetic colleagues. 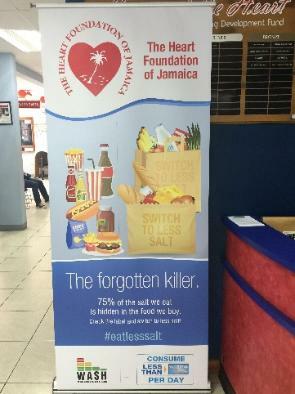 The Heart Foundation of Jamaica had a pull-up banner made for Salt Awareness Week which was placed in the lobby of their building for all patients and visitors to view. 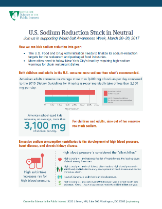 They also published a press release, which was picked up by The Jamaica Gleaner: http://jamaica-gleaner.com/article/health/20170322/salt-forgotten-killer, and they posted about World Salt Awareness Week on Twitter and Facebook each day during the week. 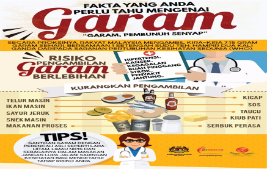 The Malaysian Ministry of Health published a press release which highlighted the link between salt and hypertension, and the risk of kidney failure, cancer, heart disease and stroke. 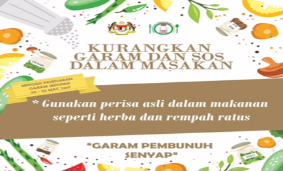 The press release also referred to the current salt intake of the staff at the Ministry of Health, sources of salt in the diet, current strategies to reduce salt intake, such as reformulation. The Ministry conducted a product survey with the National University and Putra University. They will analyse the data and present to the technical working group to contribute to baseline data and help with reformulation activities. 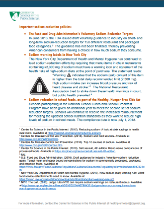 They also distributed factsheets and guidelines on how to celebrate WSAW to all 15 health state departments and did TV and radio interviews (TV interview available here: https://youtu.be/edASDFdLMNQ). The press release also mentioned WASH, with a link to the WASH website. They increased their following on social media by tagging other health bodies, corporations and industry leaders and undertook paid boosting of their posts to drive a larger audience to use the salt calculator. HSFSA’s Dietician Gabriel Eksteen was featured on the Expresso Show and SABC News. 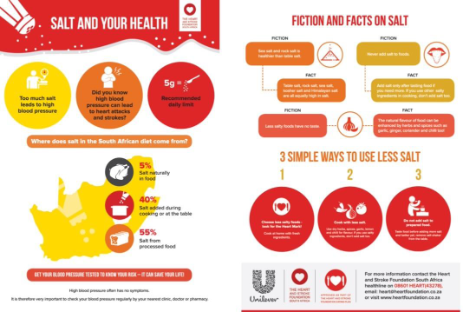 The HSFSA performed an analysis of the reach their messages during World Salt Awareness Week had in different types of media. 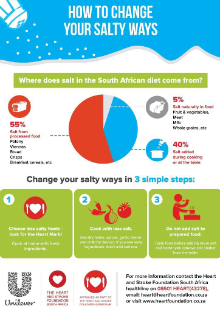 Salty South Africa – are we doing better after salt legislation? INCIENSA staff gave interviews about World Salt Awareness Week on the ‘Café Nacional, Vivir Pura Vida’ program on SINART (National Radio), the ‘Semillas y Saberes program on University Radio UCR. 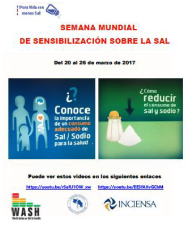 World Salt Awareness Week was also mentioned in the International Development Research Centre (IDRC/CDRI) Newsletter for the Latin America and Caribbean Regional Office, and their poster was shared through social media, public institutions and important NGOs in the country. The National Food and Nutrition Centre (NFNC) in Suva held an event to mark the beginning of World Salt Awareness Week which was attended by more than a thousand students in the Central Division. The NFNC also provided technical updates for the Parliamentary Speakers Debate on NCDs on the 27th March, as well as providing input to the Fiji Salt In Action (FSIA) Project that was handed over by the Prevention of Obesity and Non-Communicable Diseases (C-POND), Fiji National University to the Ministry of Health and Medical Services. 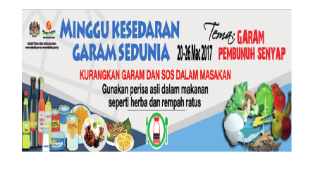 Furthermore a television advertisement on ‘Hidden Salt’ was developed, which was aired in February, in order to build awareness beyond WSAW. 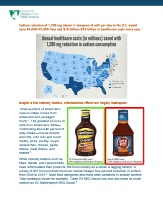 This ad continues to be aired weekly in a vernacular TV Program that the NFNC co-sponsors and provides nutrition advice on.